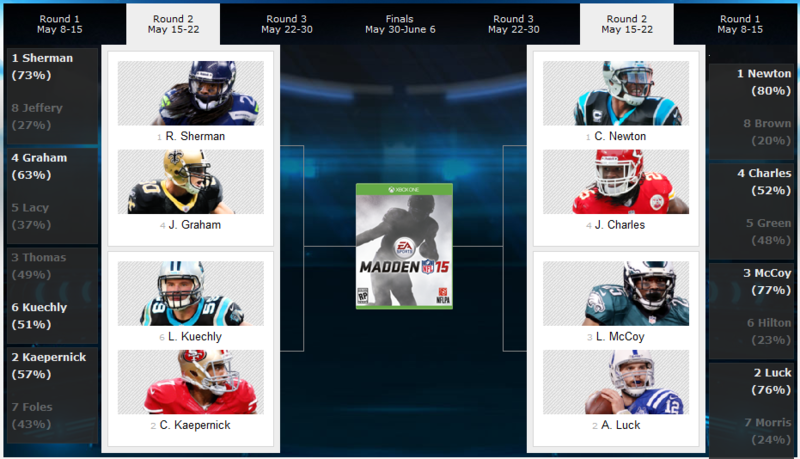 8 players have advanced to the second round of the cover vote tournament for EA Sports’ upcoming game, Madden NFL 15. Cam Newton, Richard Sherman, Andrew Luck, LeSean McCoy, and Jimmy Graham all easily advanced receiving anywhere from 63% of votes (Graham) to 80% of votes (Newton). Panthers linebacker Luke Kuechly edged out Broncos wide receiver Demaryius Thomas in a squeaker barely gathering 51% of the vote to Thomas’ 49%. Chiefs running back Jamaal Charles similarly beat out Bengals wide received A.J. Green 52%-48%. Colin Kapernick defeated Nick Foles 57%-43%. The matchups in the second round are Richard Sherman vs. Jimmy Graham, Luke Kuechly vs. Colin Kaepernick, Cam Newton vs. Jamaal Charles, and LeSean McCoy vs Andrew Luck. Voting for this round is open starting today (May 15th) through May 22nd. You can place your votes on ESPN.com. Madden 15 is scheduled to be released on August 26th on the XBOX One, PlayStation 4, XBOX 360, and PlayStation 3.
Who do you want to see on the cover of Madden NFL 15? Let us know in the comments section below.